Have you ever hit the inside of your elbow in just the right spot and felt a tingling, weird pain? That’s your funny bone, which got its nickname because of that funny feeling. The funny bone is not really a bone at all, but rather the ulnar nerve. At the elbow, the ulnar nerve travels through a tunnel of tissue, the cubital tunnel, from your neck to your hand. At the elbow the nerve runs under a bump of bone at the inside of your elbow, the medial epicondyle, and the nerve is close to your skin. Bumping it causes a not-funny, shock-like feeling. The most common place for ulnar nerve compression is behind the inside part of the elbow called cubital tunnel syndrome. Numbness and tingling in the hand and fingers, particularly when the elbow is bent while driving, sleeping, talking on the phone, or hiking or skiing with poles. Difficulty with finger coordination on computers or musical instruments. Sleeping with your elbow bent. Leaning on your elbow for a long time. Fluid buildup in the elbow. A direct blow or hit to your funny bone. 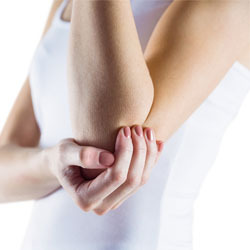 Avoid activities that require you to keep your arm bent for long periods. If working on a computer, keep your arms at a comfortable 90-degree angle in a nice, neutral resting position. Avoid leaning on your elbows. Keep your elbows straight at night when you are sleeping. If your symptoms interfere with normal activities or last more than a few weeks, schedule an appointment with your DOC orthopedic specialist. He or she will discuss your medical history and general health, examine your arm and hand to determine which nerve is compressed, test for feeling and strength in the fingers, and tap the funny bone. If your symptoms have just started, the orthopedist may recommend an anti-inflammatory medicine such as ibuprofen to help reduce swelling, bracing to keep the elbow straight, and exercises to prevent stiffness. If nonsurgical methods do not improve your condition, the DOC surgeon may discuss surgical options to take pressure off of the ulnar nerve, the funny bone, so you can feel good and laugh again.